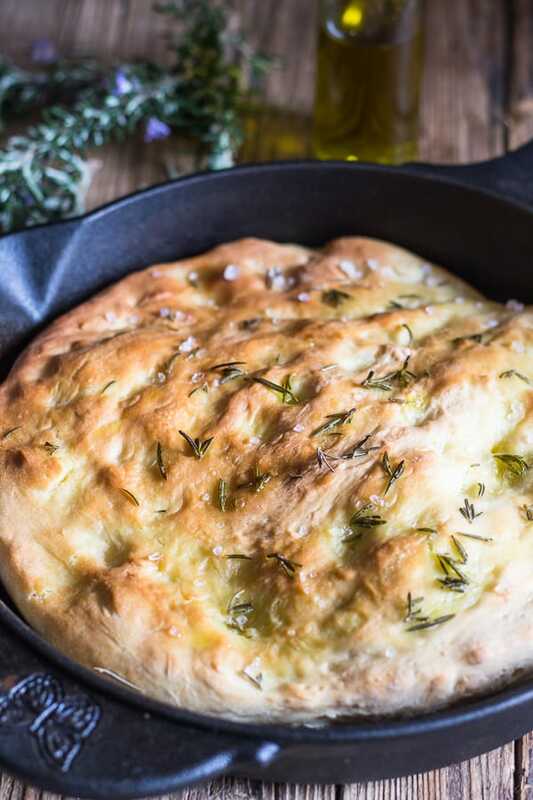 Easy Focaccia Bread, a delicious alternative to bread, a pizza type dough topped with olive oil, salt and fresh rosemary then baked to perfection. Focaccia or Pizza? Good question, I love both. When I make pizza I usually make it loaded with veggies or light and no tomato sauce or as it is called in Italy, Pizza Bianca. 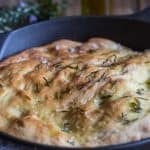 But my Easy Focaccia I like simple, drizzled with olive oil and salt and sprinkled with some fresh rosemary leaves and then baked. Focaccia can be either a very soft dough or less soft but with a lightly crunchy crust. Sometimes the dough may have a little malt or honey added. The dough will remain soft with a crunchy bottom, thanks to the olive oil that is drizzled on the bottom of the pan. Focaccia Bread is perfect for making a simple sandwich. Italians love to slice the focaccia in the middle. Open it up and fill it with some amazing Italian prosciutto, mortadella or salami and a slice of cheese preferably something strong like a goat cheese. So good! 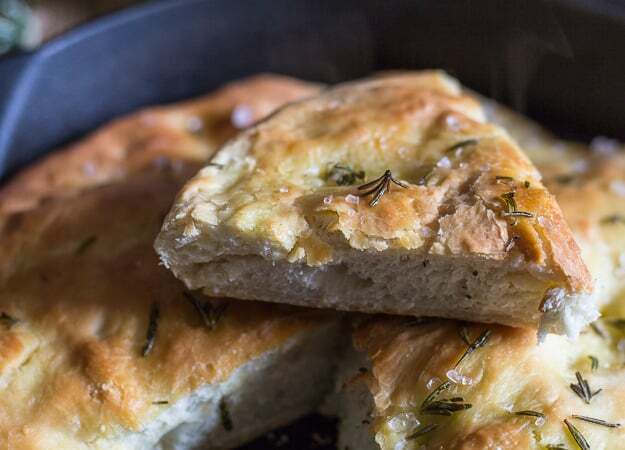 This Easy Focaccia is so delicious and goes great with a bowl of chili or your favourite stew or soup. Not only that, but why not make a couple and cut them up and fill a basket to be served along with a cheese or cold cut platter during the holiday get togethers? Everyone needs a little Italian. 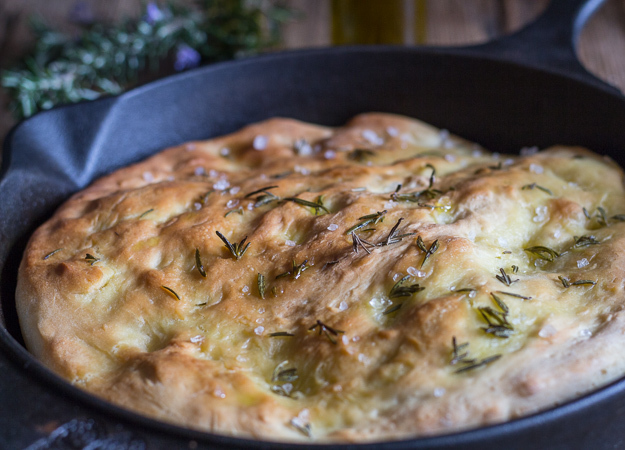 However you decide to eat or serve this Focaccia Recipe I hope you enjoy it. Buon Appetito! Place dough into a lightly oiled glass bowl (and swirl the dough so that it is lightly covered with oil). Cover the bowl and let the dough rise 1 hour in a warm draft free area. Pre-heat oven to 400° (200° celsius), lightly oil a 12 inch skillet or pizza pan. Remove the dough from the bowl and punch it down a few times. Place dough in a 12 inch skillet or pizza pan spread the dough, then cover it and let it rest for approximately 15 minutes. Spread the dough again if needed. Using your finger tips or knuckles make indentations in the dough. 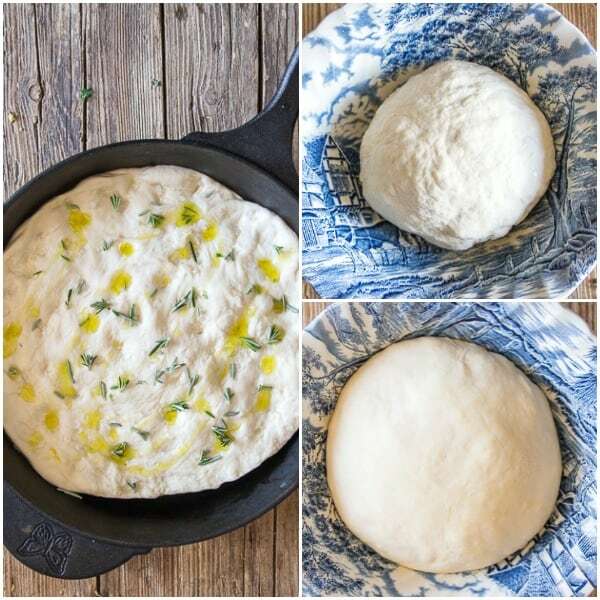 Drizzle the top of the dough with 2-3 tablespoons of olive oil (brush the olive oil to cover the dough) then sprinkle with rock salt and rosemary leaves. Bake for approximately 15-20 minutes (check after 15 minutes). Serve warm. Enjoy! Made this last night. It was easy and delicious. 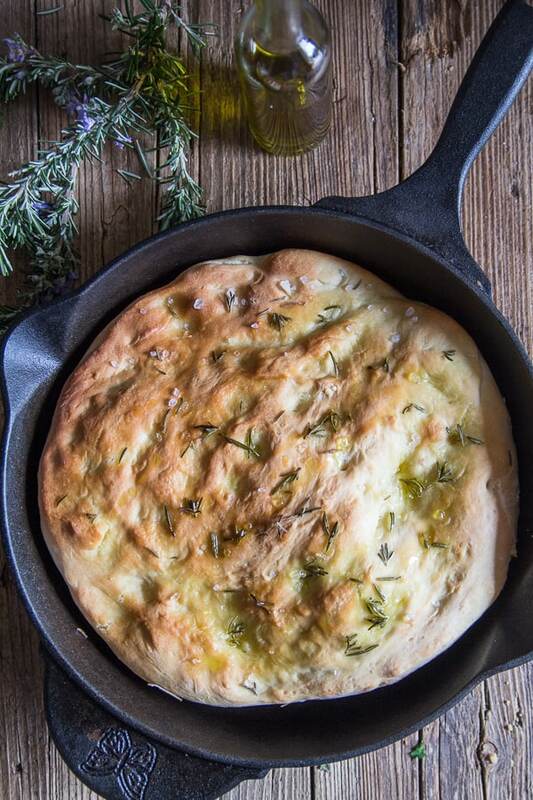 I’ve made focaccia before, but never in an iron skillet. I think using the skillet added a nice bit of crispness to the crust. I also appreciate that you not only recommend food pairings, but also include links to the recipes for the recommended pairings. I also made your fish soup. Perfect meal for a cold, snowy evening. Hi Renea, thanks so much, and glad you enjoyed the fish soup too. Have a great weekend. No need to grease pizza pan? Hi Elon, it can probably last about 2 days in an airtight plastic bag. Hope that helps. Hi Rupal thanks so much and glad you enjoyed it. Have a wonderful Sunday! Looks delicious! You’ve inspired me to get baking again! Hi Kathryn, thanks so much. So glad I inspired you, let me know how it goes. Have a great weekend. Who doesn’t love focaccia? Definitely will be making this. Hi Ann, haha I know. Let me know how it goes. Have a great weekend. There is nothing that says comfort and home as the aroma of bread baking in the oven. Yummy! I think I love this season just because of all the baking and homey doings in the house. The focaccia looks delicious. Hi Marisa, I know I just love the smell too. I guess that is why fall is my favourite season. Have a great day.